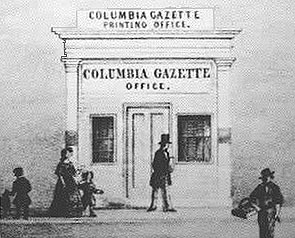 The present building is a reconstruction of the Columbia Gazette Office from this 1855 Lithograph. The original location was where the Ice Cream Parlor now stands. After the July 10th 1854 fire destroyed the wood structure owned by Duchow (a newspaper editor) and others, the original one story Greek Revival building was built, later adding a second story to house the print shop with a bookstore below. August 25, 1857, the building was lost to fire. It was rebuilt out of wood, and lost to fire again in August 1859. August 1860 the building was rebuilt as a two-story brick structure. The original front still stands between the Fallon Hotel and Theatre. The property under the current 1966 building is a site that had been mined since 1863. The Ticonic Hotel was on this lot from the early 1850's. It was destroyed by one of the many fires this street suffered. The lot once spanned the distance to the Maine Gulch at street level height. Today it is the home of Columbia Booksellers.